Preheat oven to 350°. Line 9-inch square baking pan with aluminum foil; set aside. For CAKE, whisk together flour, brown sugar, spice, baking powder and baking soda in large bowl. In another bowl, whisk together pumpkin, eggs, Country Crock® Spread, orange peel and orange juice. Stir into flour mixture until blended. Pour into prepared pan. Bake 1 hour or until toothpick inserted in center comes out clean. Cool on wire rack. For FROSTING, beat confectioners sugar, Spread, cocoa powder and milk in large bowl with electric mixer until smooth. With mixer on low speed, drizzle in melted chocolate and beat until blended. Set aside. For DECORATIONS, Using pastry bag fitted with plain tip (or zip-tp bag with small piece snipped from corner) pipe melted white chocolate into "ghosts" and melted chocolate into "trees" onto parchment or aluminum foil lined baking sheet. Refrigerate until firm, then carefully lift off paper. Decorate tombstone-shaped cookies with melted chocolate if desired. Frost top and sides of cooled cake. Crumble chocolate cookies to make “dirt” and sprinkle over top of cake. Quickly place "tombstones" into frosting. Add "ghosts", "trees" and pumpkin candies. 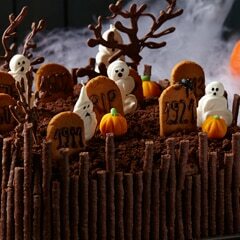 Attach chocolate stick candies or pretzels around sides of cake to create a fence so ghosts can’t escape!